ABBOTT PARK, Ill., Dec. 19, 2018 /PRNewswire/ -- Flavored sparkling water is currently a taste bud darling, and fans can now enjoy a new effervescent option: Pedialyte® Sparkling Rush™ powder packs. Abbott (NYSE: ABT) developed this rehydration solution just in time for the holidays, so you get the refreshing fizz you crave in a convenient packet, to easily upgrade your water on the go. "There's a reason so many turn to Pedialyte when they need help hydrating – it works," said Jennifer Williams, MPH, Research Scientist at Abbott who specializes in hydration. 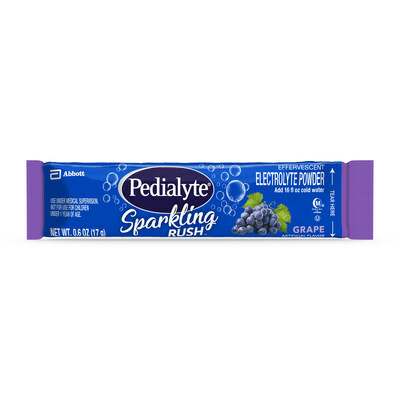 "Pedialyte is so effective because the levels of electrolytes and carbohydrate are optimal for rehydration, and now our Pedialyte Sparkling Rush powder offers a new, on-the-go option for those who love some bubble in their beverages." The holiday season is unfortunately rife with dehydration pitfalls. With flu season in full effect, air travel to visit loved ones, and even those late nights out with friends, you've got a recipe for your body to lose more water than it takes in, causing dehydration. Losing water also means losing electrolytes – essential minerals like sodium and potassium that are responsible for maintaining proper fluid levels in your body, balancing your blood's pH levels, and firing signals to your nerves and muscles. Dehydration can bring on a headache, fatigue, even dizziness, which is no way to celebrate. Proper hydration not only makes you feel better, it can improve mood, brain function and energy levels. And, while drinking water is an important part of staying hydrated, often water alone won't provide enough electrolytes when you are mildly to moderately dehydrated. While some people look to sports drinks for electrolytes, the leading ones aren't optimized for rehydration like Pedialyte. They are higher in sugar and lower in sodium, and may actually make dehydration worsei. Pedialyte Sparkling Rush is a medical-grade hydration solution that replenishes the body with twice the electrolytes and half the sugar of leading sports drinks*, and no artificial colors. By incorporating the flavor and fizz that people love so much about sparkling water, Pedialyte Sparkling Rush powder packs make rehydration refreshing and fun. Just add one Cherry or Grape-flavored powder pack to a glass or nearly-full bottle of cold water, wait 10 seconds, and enjoy. 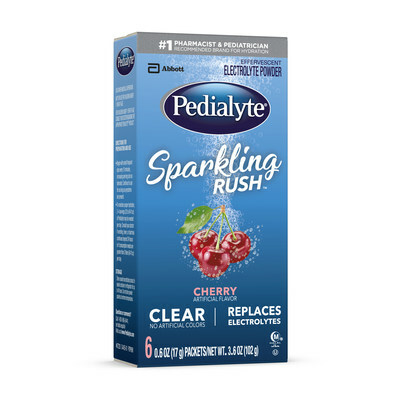 Pedialyte Sparkling Rush in Cherry and Grape powder packs are available at Target and Meijer grocery stores nationwide, as well as online at Amazon. To learn more about preventing dehydration, visit pedialyte.com. 1 Limbos MA, et al. Contemp Pediatr. 1996:1-12. *Each Pedialyte product has at least 1030mg sodium and no more than 25g sugar per liter; leading sports drinks have ~460 sodium and ~58g sugar per liter.